Nav/Contact icon mobile Copy 2 Created with Sketch. Capping off a month that saw the total pool of negative-yielding Eurozone government debt increase to EUR 3.3 trillion, Germany’s 10-year bond yield dropped by 25 basis points to end March at -0.07%. This was the first month the Bund entered negative yield territory since October 2016. At its March monetary policy meeting, the European Central Bank left interest rates unchanged and announced a new series of quarterly targeted longer-term refinancing operations (TLTRO-III), starting in September 2019 and ending in March 2021. Among the Euro area countries, Austria’s 10-year government bond yield saw the biggest decline during the month, falling by nearly 30 basis points to 0.23%. Similarly, the yield on Denmark’s 10-year note finished March 29 basis points lower at 0%, while its Belgian and Finnish counterparts decreased by 27 basis points to close at 0.41% and 0.17%, respectively. Elsewhere in Europe, the UK 10-year Gilt yield fell by 30.5 basis points to 1%. On March 21, the Bank of England reached a unanimous decision to maintain interest rates at 0.75%. The central bank said that the country’s economic outlook will continue to depend significantly on the nature and timing of Brexit, while a special survey revealed that around 80% of firms across the UK judged themselves to be ready for a no-deal outcome. Across the Atlantic, the yield on the U.S. 10-year Treasury fell as low as 2.37% on March 27, but closed the month at 2.41%, a 30 basis points drop from the end of February. The Federal Reserve held the target range for the federal funds rate at 2.25-2.5%, and signalled there would be no hikes at all until the end of 2019. The Bank of Canada also kept interest rates on hold at 1.75%. 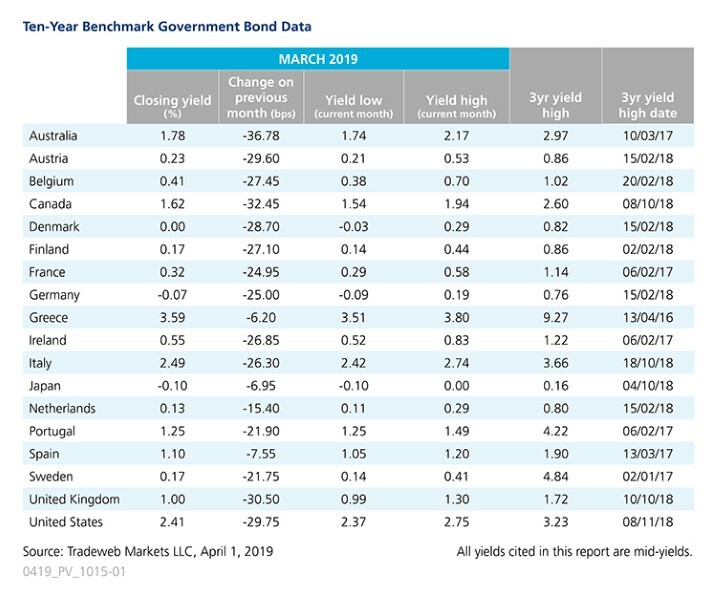 The country’s 10-year government bond mid-yield declined by 32.5 basis points over the month to reach 1.62% on March 29. In the Asia Pacific region, the yield on Australia and Japan’s 10-year government bonds dropped by 37 and 7 basis points to end March at 1.78% and -0.10%, respectively. Both countries’ central banks kept rates steady, in order to achieve their inflation targets and support economic growth.